Hi, Pam has got another super challenge @ 365 'Circles'. This one is for my hubby - Merry Christmas sweet. I made the background paper with a halftone patterned brush. I like the way the circles become gradually smaller and there are definitely more than 10! I added a bit of text and Santa. Voila. Enjoy. EDIT: My Santa is now available at Squigglefly 2010. OMGoodness...you have thee cutest designs!!!! Excellent job on the circles challenge! I love your blog! I can't wait to download some of your clipart and start playing! Thanks so much for leaving the comment at I SPI, I may not have found you otherwise. Merry Christmas! 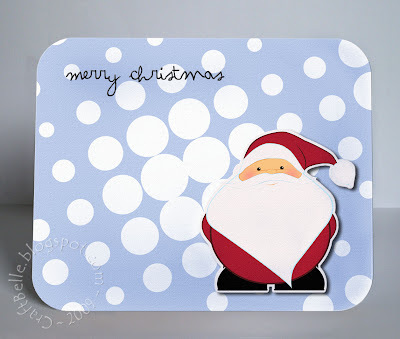 what a cute and jolly card - lovely.hanks for the freebie of Santa too - can make my own now! A wonderful card and the cutest Santa I think I've ever seen!! ok, this is seriously ADORABLE! What an awesome Santa!